The two square rectangles in the center of this SEM picture are the two resonators. GSM, WiFi, Bluetooth, 4G, GPS: a smartphone already has to handle many wireless standards. And this number will only increase further. There are still no good filters to keep all those future standards separate. Researchers at the MESA+ Institute for Nanotechnology have taken an important step with a new type of filter, based on micromechanics. They have published their finding in Applied Physics Letters. Filters that can be accurately tuned to the frequency band you want to receive as a user are becoming increasingly important. Otherwise, if a nearby signal is much stronger, it drowns out the signal you want to receive. The number of available frequencies is limited, so it is becoming ever busier. Intelligent use of the airwaves, by utilising every available piece, is becoming more important. The filters now presented by the researchers are based on micromechanical resonators and can be accurately tuned to the desired frequency. One of the reasons for choosing a mechanical solution is that the conventional filter consists of an inductor and a capacitor, an 'LC circuit'. Especially a good quality inductor is hard to achieve on a chip. The result would be: separate LC circuits for each frequency band, mounted outside the chip, which would take up too much space. New solutions are already being sought all over the world. The current standard is the electromechanical filter called Surface Acoustic Wave filter, but this, too, requires too much space if you need several of them. The solution presented by the researchers consists of two mechanical resonators. They vibrate at an adjustable frequency thanks to the piezoelectric material PZT. This material is applied to metal. Normally, the piezoelectric material vibrates perpendicular to the metal and the thickness of the layer determines the frequency. However,the frequency can be varied by making it vibrate in the same direction as the metal. Two resonators are used, which are not connected mechanically or electrically. By means of the intelligent handling of the input and output signals of the two resonators, adverse 'parasitic' effects are negated. This is done by subtracting the output signals, while the input signals are 'in phase'. The result is a selective filter - fourth order - that passes a limited part of the band and weakens the frequencies above and below. It can be accurately tuned with the vibrating frequencies of the two resonators. 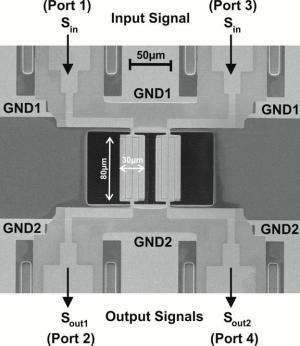 The filter presented by the researchers in Applied Physics Letters, operates at about 400 Megahertz. That is still too low for mobile applications, but new versions already reach higher frequencies, and Gigahertz frequencies needed for smartphones are feasible, according to the researchers. The output signals of both resonators (red and purple). When one is subtracted from the other, a pass band remains. 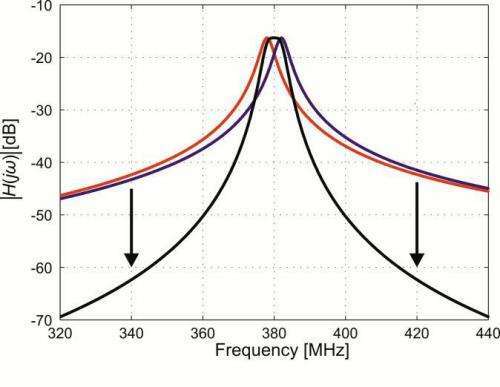 The difference in resonance frequencies defines the width of the pass band. The researchers also expect that these resonators can be integrated on the chip or directly 'bonded' to the chip: they are much smaller than inductors. It therefore becomes possible to apply fifty resonator pairs, which facilitates flexible use of frequencies. This is needed, for example, in 'cognitive radio', that uses each piece of free space as it becomes available and then jumps to another frequency when needed. More information: Yagubizade, H. et al. A 4th-order band-pass filter using differential readout of two in-phase actuated contour-mode resonators, Applied Physics Letters, 2013.